The sole purpose of this tutorial is to show where the Texture Library is and how to use it. I've read through chapters 8 and 9 in the Bryce3D manual and this information is not there. In order to get to where we're going, I'll have to describe some of the scenery along the way. Before we go anywhere, though, there's one big question. What is the difference between a material and a texture? The answer is - a material is composed of zero or more textures. Figure 1 shows a material composed of zero textures. Quite a bit can be done with materials without even touching textures, let alone the Texture Library. Let's look a little more in depth at Figure 1, in particular, what are those pink numbered circles all about? The things I circled are little triangle guys that bring up other menus or dialogs. Preview Options Menu - This menu lets you pick a different object or view for this little preview window. More info on page 234 of the manual. Material Presets Library - This is the same dialog you get clicking on the triangle next to the Edit menu select thing, or clicking on the cube-with-a-crack-in-it control on the Edit menu itself. There's some stuff on this dialog in the manual, but I'll assume most folks are already familiar with this one. You know the one, Simple and Fast, Planes and Terrains, Rock and Stones, and so on. Material Options Menu - Here's where you can tell your material to not cast shadows, amongst some other strange options, all detailed in the manual on pages 225-229. By the way, no object need be selected first to get into all this fun, the keyboard shortcut Command-M (Mac) or Control-M (Win) will open the Material Lab at any time. After you edit your new material, you can use that second triangle guy to then save your material as a preset. Now onward, to the Texture Library! Remember those menu titles, you'll see them again shortly. 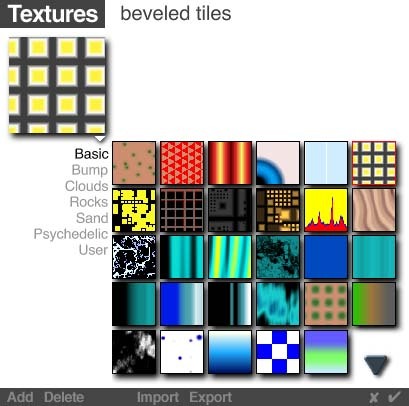 The next stop along the way is the Texture Source Editor (also called the Deep Texture Editor, or DTE). You get there via the pinker of the two buttons in the upper left corner of a texture component. I'm not going to touch the DTE with a 10 foot pole here. You can find excellent information about what all that stuff does in Susan Kitchens' book Real World Bryce 2 (the functionality is the same, though the interface is different). There is also some mediocre information on the DTE in the Bryce3D manual on pages 240-276 (basically all of chapter 9...). Check out those categories! 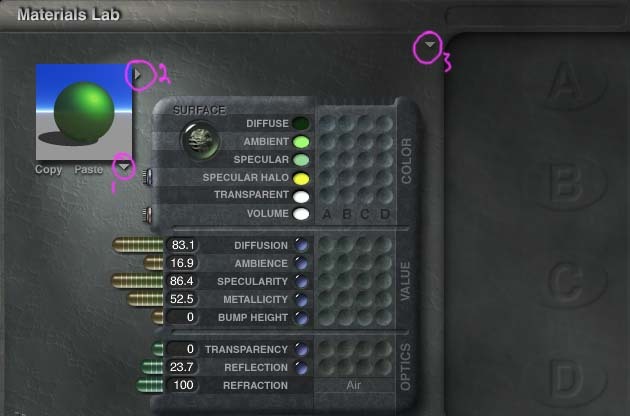 They're the same as that menu of pull-rights accessed from that button/triangle hybrid thing on the texture component. So, if you've ever wondered how to get the texture A out of material 'Foo' and use it as texture C of material 'Bar', all you have to do is 'Add' it into the Texture Library and then you can get it back out again from that pop-up for texture C.
UPDATE! There's a shorter way to get to the secret texture library than by going through the DTE. If you shift-click the button that gives you the menu titles, the texture library is displayed in its full graphical glory!